With 100% natural ingredients, every serving contains 152mg green tea and guarana extracts, which can help to boost your metabolism, suppress your appetite and boost your energy levels. Skinny Protein® is made for men and women who want to put on lean muscle and shed body fat, but don’t always have time to make diet-friendly snacks. With a host of active ingredients, the thick formula is filling and can help curb your daily calorie intake and sugar cravings. Developed in 2009 – long before skinny or diet protein became popular – Skinny Protein® has helped tens of thousands of people to reach their physical goals. That’s why it’s been voted number one by leading women’s magazines and review sites. 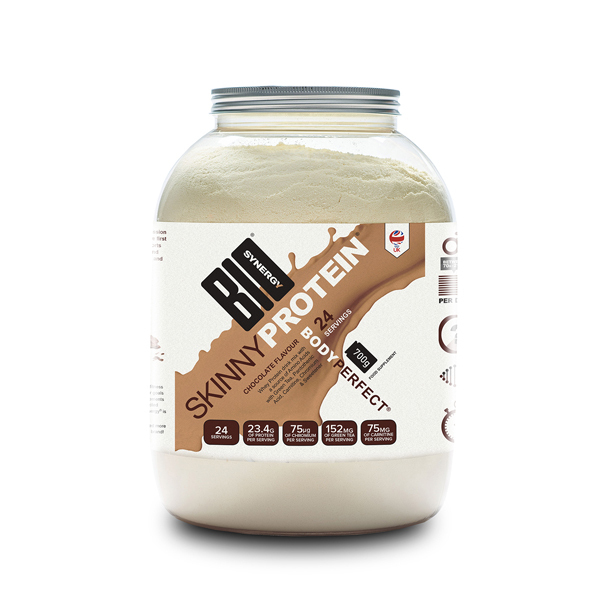 While you can drink Skinny Protein® at any time of the day, we think it’s best as an after-work out snack. With this delicious chocolate flavour, it will be the perfect supplement after exercising to aid your balanced diet and give you the energy you need to attack the day. Simple to mix - just add one scoop (30g) to 300-500ml of water, soya or skimmed milk. Have one serving between breakfast and lunch, one serving between lunch and dinner and one serving after exercise/training. This equals to three servings (90g) per day. The ingredients include whey protein, concentrate (soya & milk), flavouring, green tea standardised extract, beetroot juice powder, l-carnitine, l-tartrate, sweetener (stevia), calcium pantothenate, chromium picolinate. allergens: soya, milk. Storage: Keep sealed in a cool dry place out of direct sunlight. Food supplement not to be used as a substitute of a healthy lifestyle and balanced diet. If in doubt, please contact your GP. Do not exceed recommended daily dose. Keep out of reach of children. Click here to download Ingredients, Nutritionals and Allergy Information. In 1997, Bio-Synergy® was founded out of a passion for health and fitness and a desire to create the first clean, effective and high quality range of sports nutrition, to support the goals of athletes and fitness enthusiasts, fuel their performance and make it happen.